Looking at the patterns by Create Kids Couture, you can’t help but smile. The patterns are adorable, the fabrics they chose are perfect and the models are the best part. We recently had the pleasure to sit down with Shannon and Tiffany to learn more about what inspires them. Qw.com- Your business is a partnership. What roles do each of you play in CKC? CKC– Actually, we both do everything! We did have set roles, but then we realized if something were to happen to one of us, Create Kids Couture would suffer because we didn’t know how to do each other’s job! Most of our time these days is spent managing our staff. We have a wonderful staff of 20 stay-at-home moms and one dad to help make CKC what it is today! Qw.com- How would you describe the patterns you make? CKC– We started out Create Kids Couture with boutique style clothing patterns for girls. We’ve stayed true to the boutique style, but we’ve expanded to include boys, dolls, tweens, womens, womens plus, and even dogs! We also just started doing some home goods patterns. We have over 400 patterns to choose from on our website. Qw.com- How do you find inspiration for your patterns? CKC- Our daughter’s have been our main source of inspiration from the start. As they have grown and their style is developing and maturing, our style changes to accommodate them because they are the main reason we started sewing! Nothing is better than spending all day sewing a dress and having your daughter love it! We do have other designers working on patterns under us, and they all have a different style from us. We love it! When CKC started growing and we saw the following we were getting because our patterns were easy to follow, we knew we wanted to make it sort of a one-stop shop for PDF patterns. We knew we couldn’t do that if we didn’t grow with our customers and offer more styles. Qw.com- Many of your patterns incorporate mixed prints. What advice would you give to someone for choosing fabrics for a project? CKC- This is a great question! Honestly, when we started out we stuck to a lot of fabric lines. It’s so easy to mix and match prints within a line. When you do it often enough you get familiar with what colors you like and what colors you think go well together. You also learn what prints mix and match well so you start to do it on your own. What we love to do is use a nice large, bold print for the main dress and then tiny, complimentary prints for the ruffles, straps, etc. It really allows you to highlight each piece in it’s own way! Qw.com- Where do you find your adorable models? CKC– When we started we were lucky enough to have our daughter’s at home to photograph whenever we needed them! They dominated our site and there was no question that they were our daughter’s! Now they will both be in school full-time this year, which will make it a little harder to get the photos we need. Luckily for us, the addition of all our amazing new designers is that they all have daughters! Between us all there is no shortage of girls. Additionally, we have some amazing testers with great taste and cute children so our website is a cuteness overload of dogs, babies, and children! Qw.com- What kind of pattern do you enjoy designing the most and why? 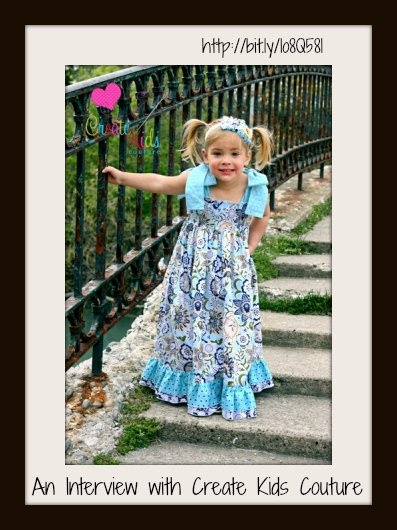 CKC– We are probably best known for our girly, over-the-top, ruffled designs. Our patterns were very distinguishable because there was no shortage of ruffles! We toned it down since we started because our daughter’s tastes changed, but our staffs with the younger girls are keeping it going and we love them for it! Tiffany and I have been doing a lot with knits lately because that’s what our daughters like and, after all, that’s why we started sewing. Qw.com- As pattern designers, what is your biggest challenge? CKC– Choosing just one pattern to make! Sometimes, I will just be so overwhelmed with ideas I can’t even concentrate on one of them. This entry was posted in clothing patterns, Designers, patterns, QuiltWoman and tagged create kids couture, quilltwoman.com, quilt patterns. Bookmark the permalink.